Alumna Jody Watty (Recreation, Parks, and Tourism Administration, ’97) has long been passionate about working with and for people with special needs. While growing up in Thousand Oaks, California, Watty became close friends with her neighbor, Jeff, who had a developmental disability. 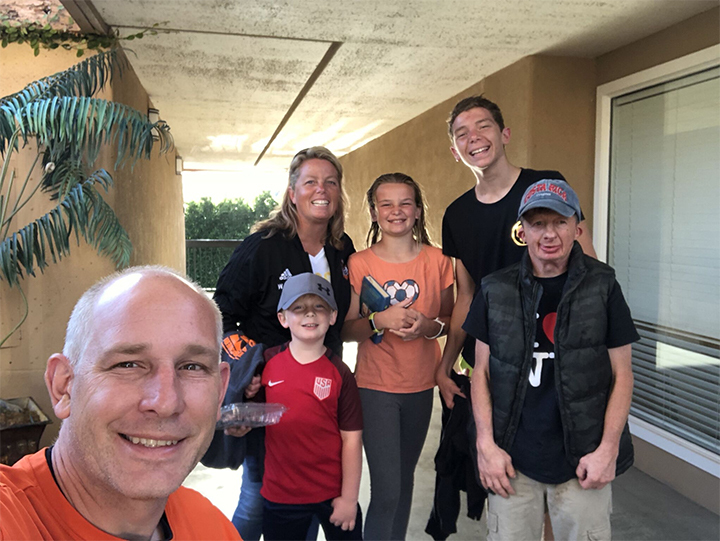 Today, she still considers him one of her “favorite people in the world.” Her friendship inspired her to become a volunteer at the Special Olympics in Ventura County — foreshadowing an illustrious career helping those with special needs. Where else do you get to see the best of people, just working hard to make someone else’s life better? When Watty arrived at Cal Poly in 1992, she immediately sought out Special Olympics in San Luis Obispo County to volunteer while attending college. She established a relationship with the director at that time, which eventually blossomed into Watty’s role as the regional director of the San Luis Obispo County Special Olympics. She has held that title for 21 years. Watty gained more from Cal Poly than professional readiness — she also met her husband, Justin, who was also majoring in recreation, parks and tourism administration. They married in 2001 and have three kids: Logan, 15; Aly, 11; and Parker, 5. Today, their bustling family also includes three dogs, two cats, two tortoises and a bunny.